If you're looking for something that will warm your belly and make your taste buds tingle, udon soup is one of the best options out there. This dish is becoming increasingly popular, most likely because it's cheap, filling and delicious. But no broth is exactly the same, and there are a range of different flavours you can add to the soup. 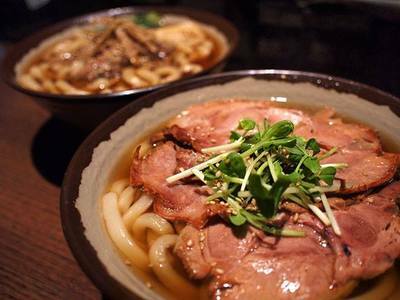 So what's your favourite udon soup in Sydney? Wagamama has a few convenient locations in the heart of the city, they serve authentic Japanese food with a modern twist. They also cater to vegetarians. I love how fresh their flavours are. I love my udon quite spicy on a cold winters day. You can specify how strong or mild you like it since they cook everything fresh on the spot. Great place for lunch or dinner with a very simple yet modern setting. Ah of course Wagamama. Man these Sydney storms are giving me the craving for this hot and spicy stuff....mmmmm. Really generous servings are available at Ramen Kan at Haymarket. They also have a store in Chatswood. You are super full at the end. Can be a little salty at times, yet the udon and the good stuff is smack bang on generous for your bucks. My favourite udon place is hands down, Mappen Noodle Bar in the city on George Street. The broth there is lovely and sweet, and there's a whole tempura bar to choose from. It's quick and convenient and overall, super cheap. The iced green tea slushy is a highlight and I recommend the hot udon soup with an egg on top. Plus the cinemas are just up the road so it's easy to make a night out out of it. Ramen Kan is great in terms of getting good value for your money. You leave feeling super full!